I think it was in 2004 when I met Pranay Dutta, an AIDS activist from Calcutta who was on a world tour attending several AIDS conferences in Europe, Asia and America. Pranay Dutta was then (and I understand he still is) the secretary of Sonata Foundation, an NGO in Calcutta who was trying to spread AIDS awareness in West Bengal and India through music, documentaries and performing arts. His theory was that HIV/AIDS awareness through print media was bound to be a failure in India where the majority of the affected people are illiterate. He thought that if this message can be spread out using music and performing arts then it could have the greatest impact. During my discussions with Pranay, he told me numerous incidents of how HIV and AIDS are affecting the poor Indian population. But what struck me most was the fact that how this disease was surreptitiously spreading amongst the educated, urban middle class. He told me several incidents of well-to-do middle class families affected with HIV and their attempts to hush it up, just like the way people used to do in the early half of the twentieth century when people got infected with TB or Leprosy or something similar. The fear of social back lash was more than the disease itself. Anybody infected with HIV is immediately branded as an immoral social outcast – some one who does not have the right to exist amongst the social elite. Most middle class family consider themselves immune to HIV and think that this is only a poor man’s disease. As Pranay says in one of his interviews with Voice of America, people in our society doesn’t care about HIV until someone in their family is infected. It is difficult to make someone aware when he or she doesn’t want to be. When Pranay learned that I write plays, he requested me to write a play on this issue. I thought about it for a while, started delving into some research and even contacted couple of medical practitioners who deal with HIV/AIDS. However, I had no intention of writing a play that only deals with the issue of HIV/AIDS. I wanted a bigger canvas, a canvas where our lives (as immigrants in the country) are intertwined with those of our friends and family in India. If we look back to the history of HIV/AIDS in USA, the story was not any different from what it is in India now. Films like “Philadelphia” and plays like “Angels in America” depict the social apathy during the 80’s and 90’s towards HIV and AIDS victims quite vividly. Hence, for a person who has encountered that situation in USA from close proximity – another encounter at a different time and space would be quite painful to say the least. And from this evolved the play, Banaprastha (The Retirement). The play Banaprastha tells the story of a senior virologist Dr. Parijat Sen, who returns to India, after retiring from his medical practice of 35 years, to find peace, tranquility and solace amongst his family and old friends. But soon he discovers that his nemesis has followed him and he has nowhere to hide. The play, on multiple levels, depicts the rapid change in the economic, social and cultural life that is happening in India today due to the effects of globalization. The changes are too drastic for a person like Parijat Sen whose perception of his native land is nearly unchanged from the time he left for the U.S. But when he arrives in the city of his youth, he finds that there is hardly any difference between the middle-class life in New York and that in Kolkata. And in the process of his rude awakening, he encounters his old nemesis – the Human Immunodeficiency Virus or HIV. He finds that the virus has climbed its way through the social ranks and is now infiltrating the middle class. Dreadfully he also finds that this so-called educated and enlightened society is in a state of denial and refuses to deal with the disease – just the way he saw it happen during the early days of his career in the States. The play was first written during the 2004-2005 time frame. It was again thoroughly revised during 2008 and 2009 when it reached its current form. The rapid changes in dealing with this disease in India were one of the main reasons for the revision. In 2004/2005 Bula-di was an unknown entity in Calcutta. 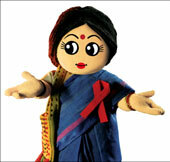 Now, Buladi (the cute little doll) is everywhere spreading AIDS awareness in the most gentle way possible. AIDS awareness has gone a long way in these 4/5 years, but lot more needs to be done to make a lasting impact. Please join me along with the cast and crew of “Banaprastha” on May 16/17 and 30/31st at the Edison Valley Playhouse (Edison, NJ) to show our solidarity with the people around the globe who are fighting this epidemic of our times. This entry was posted in Arts-Culture and tagged AIDS, HIV, India, play, theater by sudipta. Bookmark the permalink. It’s interesting how many myths actually surround the topic of HIV/AIDS. First and foremost, HIV can’t be cured, but it can be treated. Ignoring the problem doesn’t have it go away. It’s like cancer in that sense. Secondly, HIV does not only affect gay men and drug users. HIV is something that can be spread through various channels, and it is noted that in today’s age of America, most people who have HIV are heterosexual and clean of drugs! It’s so condemned in society but really, it’s just another sickness that needs treatment, if not careful in the first place. And lastly, HIV and AIDS are not the same thing, as the former is a virus and the latter is a collection of illnesses. This play sounds very interesting. It’s strange how people of our grand community treat something perceive situations they know very little about. I guess it’s because they are used to knowing so much about things, that something foreign like this is climbing it’s way through the latter. But it’s THAT reason only that people should be more understanding and educated of how to go about the situation, rather than forcefully ignore their condition. I hope I can make it to the show! Great article and as always, I support you 100%! I also support them who have AIDS.